Code read Your employer can no longer play fast and loose with your health information. A firm could be breaking the law if it fails to respect new rules on workers' privacy. And the new code warns them to think twice about the health records they hold and the hoops they ask you to leap through, whether this is health screening, medical, drug, alcohol or genetic tests. 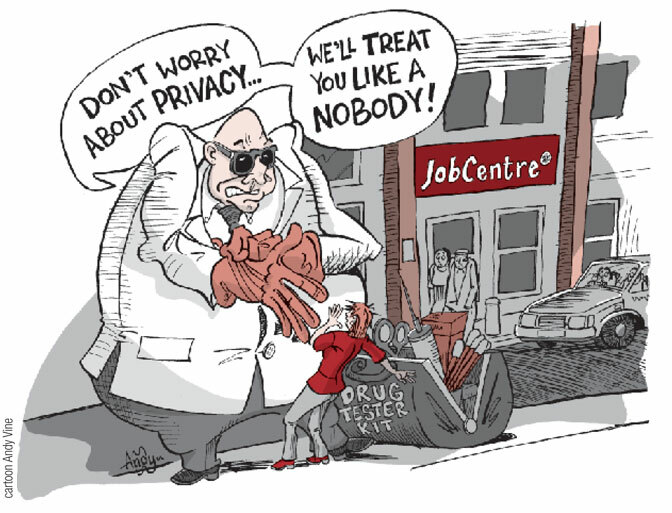 The drug testing habit The drug tests don't work, but that's not stopping employers. Hazards argues for sensible drug and alcohol policies. Gene machine Not perfect? One day soon it may cost you your job. As the gene testing gadgets become a wrong headed but affordable option, more employers are expressing an interest. If employers have their way they will soon be testing more than your patience. Companies are becoming more and more keen on alcohol, drug and genetic testing at work. They monitor your email, your phone calls, your work rate and your whereabouts. Hazards warns this scrutiny is a dangerous distraction that will be bad for your safety and privacy, and argues it may be their company, but your body is your business.